A Oregon Parks and Recreation photo shows residents standing before a huge floating dock in Agate Beach, Oregon on June 5. 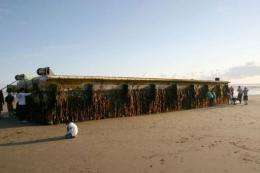 US officials ordered Japanese seaweed and barnacles to be stripped from the tsunami-wrecked dock to guard against "possible invasive species" from Japan. When debris from the 2011 earthquake and tsunami in Japan began making its way toward the West Coast of the United States, there were fears of possible radiation and chemical contamination as well as costly cleanup. But a floating dock that unexpectedly washed ashore in Newport this week and has been traced back to the Japanese disaster has brought with it a completely different threat  invasive species. Scientists at Oregon State University's Hatfield Marine Science Center said the cement float contains about 13 pounds of organisms per square foot, and an estimated 100 tons overall. Already they have gathered samples of 4-6 species of barnacles, starfish, urchins, anemones, amphipods, worms, mussels, limpets, snails, solitary tunicates and algae  and there are dozens of species overall. "This float is an island unlike any transoceanic debris we have ever seen," said John Chapman, an OSU marine invasive species specialist. "Drifting boats lack such dense fouling communities, and few of these species are already on this coast. Nearly all of the species we've looked at were established on the float before the tsunami; few came after it was at sea." Chapman said it was "mind-boggling" how these organisms survived their trek across the Pacific Ocean. The low productivity of open-ocean waters should have starved at least some of the organisms, he said. "It is as if the float drifted over here by hugging the coasts, but that is of course impossible," Chapman said. "Life on the open ocean, while drifting, may be more gentle for these organisms than we initially suspected. Invertebrates can survive for months without food and the most abundant algae species may not have had the normal compliment of herbivores. Still, it is surprising." Jessica Miller, an Oregon State University marine ecologist, said that a brown algae (Undaria pinnatifida), commonly called wakame, was present across most of the dock  and plainly stood out when she examined it in the fading evening light. She said the algae is native to the western Pacific Ocean in Asia, and has invaded several regions including southern California. The species identification was confirmed by OSU phycologist Gayle Hansen. 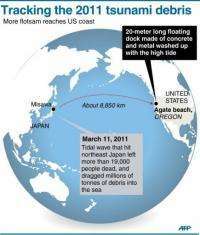 Graphic showing the Pacific Ocean where a huge floating dock untethered in the 2011 Japanese tsunami has crossed some 8,850 km of open sea to wash up on the US coast. "To my knowledge it has not been reported north of Monterey, Calif., so this is something we need to watch out for," Miller said. Miller said the plan developed by the state through the Oregon Department of Fish and Wildlife and Oregon State Parks is to scrape the dock and to bag all of the biological material to minimize potential spread of non-native species. But there is no way of telling if any of the organisms that hitchhiked aboard the float from Japan have already disembarked in nearshore waters. "We have no evidence so far that anything from this float has established on our shores," said Chapman. "That will take time. However, we are vulnerable. One new introduced species is discovered in Yaquina Bay, only two miles away, every year. We hope that none of these species we are finding on this float will be among the new discoveries in years to come." The possibilities are many, according to Miller. "Among the organisms we found are small shore crabs similar to our Hemigrapsus that look like the same genus, but may be a different species," Miller said. "There were also one or more species of oysters and small clam chitons, as well as limpets, small snails, numerous mussels, a sea star, and an assortment of worms." Invasive marine species are a problem on the West Coast, where they usually are introduced via ballast water from ships. OSU's Chapman is well aware of the issue; for several years he has studied a parasitic isopod called Griffen's isopod that has infested mud shrimp in estuaries from California to Vancouver Island, decimating their populations. In 2010, an aggressive invasive tunicate was found in Winchester Bay and Coos Bay along the southern Oregon coast. Known as Didemnum vexillum, the tunicate is on the state's most dangerous species list and is both an ecological and economic threat because of its ability to spread and choke out native marine communities, according to OSU's Sam Chan, who chairs the Oregon Invasive Species Council. It is difficult to assess how much of a threat the organisms on the newly arrived float may present, the researchers say. As future debris arrives, it may carry additional species, they point out. However, this dock may be unique in that it represents debris that has been submerged in Japan and had a well-developed subtidal community. This may be relatively rare, given the amount of debris that entered the ocean, the researchers say. "Floating objects from near Sendai can drift around that coast for a while before getting into the Kuroshio current and then getting transported to the eastern Pacific," Chapman said. The researchers hope to secure funding to go to Japan and sample similar floats and compare the biological life on them with that on the transoceanic dock. The scientists say the arrival of the dock is also a sobering reminder of the tragedy that occurred last year, which cost thousands of lives. "We have to remember that this dock, and the organisms that arrived on it, are here as a result of a great human tragedy," Miller said. "We respect that and have profound sympathy for those who have suffered, and are still suffering."